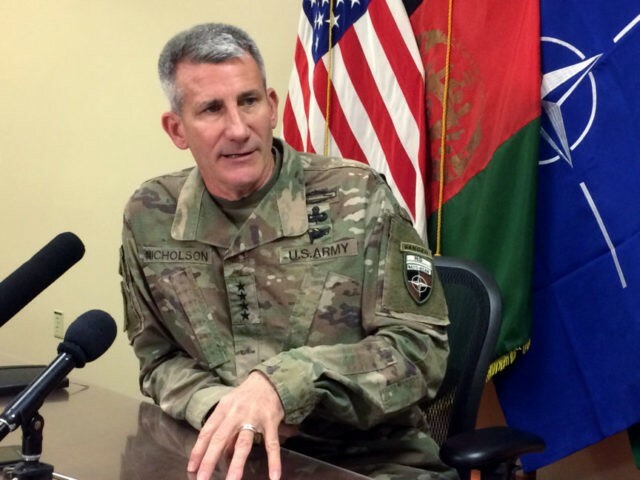 Speaking from U.S.-NATO mission headquarters in Afghanistan, Gen. Nicholson indicated, “The Afghan government’s peace offer to the Taliban was an opportunity for the group to end the violence and join the peace process,” the Afghan outlet TOLO News reports. As you all know spontaneous social gatherings in support of the peace process are springing up around the entire country, up to 20 [of 34] provinces now. And this is all following the offer by his excellency President Ghani to the Taliban that he made at the Kabul peace process conference [in late February]. We hope that the Taliban, as the Afghan people, want peace and now is the best opportunity to end this war. So, in closing, I want to remind all of our Afghan friends here today and all Afghans that we are with you and we will stay with you to help deliver the peace and stability that this country deserves after so many years of hardship. Nicholson’s comments came during a ceremony to honor the late American historian and archeologist Nancy Dupree, who died in Afghanistan last year. The United States has spent nearly a trillion dollars on the war in Afghanistan and lost 2,263 American service members, primarily at the hands of the Taliban. Terrorists have also maimed another 20,318 U.S. troops since the conflict began in October 2001. The Taliban has refused Ghani’s peace offer made in Kabul on February 28, which proposed a cease-fire, release of prisoners, the removal of sanctions, and recognition of the jihadist entity, believed to control or contest nearly half of Afghanistan, as a legitimate political group. More recently, the Taliban refused the Afghan leader’s offer to participate in the ongoing elections, insisting on its precondition before engaging in peace negotiations: the complete withdrawal of U.S.-NATO troops. The United States has rejected the Taliban’s condition, a move which appears to be on the same page with the many Americans who have grown tired of the war and wish U.S. troops to return home. Gen. Nicholson has been pushing “reconciliation” between the Taliban an Kabul as a major tenet of U.S. President Donald Trump’s strategy to end the Afghanistan war. Taliban terrorists “cannot win” under the level of pressure Trump’s strategy is applying on the terrorist group, the commander declared in November 2017. “In the face of this pressure, the Taliban cannot win. Their choices are to reconcile, live in irrelevance, or die,” Nicholson proclaimed.